I remember going to the sports bar and playing Air Hockey and shelling out 1$ for a six minute play. It is so addictive that you would not mind the expenditure. However, the great news is that I can play the same game on my Nokia N8. AirHockey Challenge is a J2ME touch optimized full screen game for N8. We tend to have a notion that java games generally tend to be slow or faulty in their overall feel on a touch phone. Well, N8 scores in that aspect of J2ME games. This game works like a charm and has quick response to touch and makes the overall gaming a fun experience. You play against the computer at four different levels of Easy, Medium, Hard and Insane. As you select a tough level, the chances of scoring a goal against the computer gets minimal and difficult. Each game gets over as soon as a player completes 6 goals. 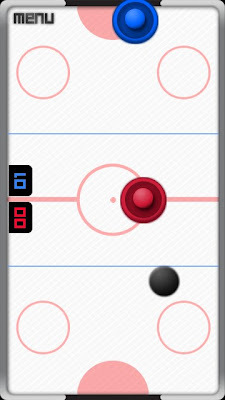 The background music of the game is similar to that of the physical board in a sports bar. When i say sports bar, i mean the place where you generally hang out playing snooker, bowling, video games, etc. You do not need a data connection for this game and can be played offline. Also, after first install, you don't need any extra settings on the phone, simply launch the game and you are good to go. Please let us know if you liked the game and have more suggestions about a similar game. Also, visit our forum to indulge in more N8 related offline topics.